Maxwell: Guys, check it out! 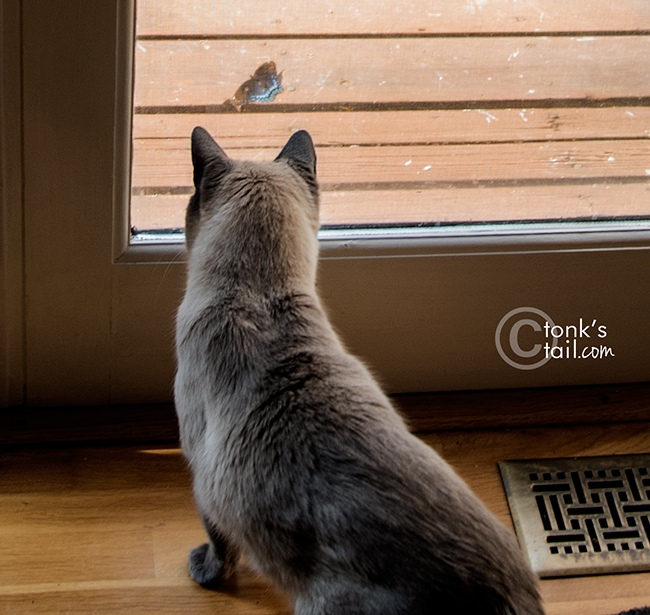 We have a new visitor. Maxwell: Oh, this is so cool. It's a Limenitis arthemis astyanax (Fabricius). Seriouslies, Maxie. Not interested. Lemons are totes sour. Maxwell: Dood. It's not a lemon. It's a Red-Spotted Purple butterfly. You'd like it, Allie. It's pretty and blue. And it's all blinged out and everything. Allie: *sniffs* Yes, but I only do pink. Does it come in pink, Maxie, hmmm? Maxwell: *sigh-h-h* That's okay Mister R-S-P.
Beautiful! Mom has been working on getting the butterfly garden started again. Wow, that's so cool that 1) you saw this pretty butterfly, and 2) you managed to snap some photos too! What? 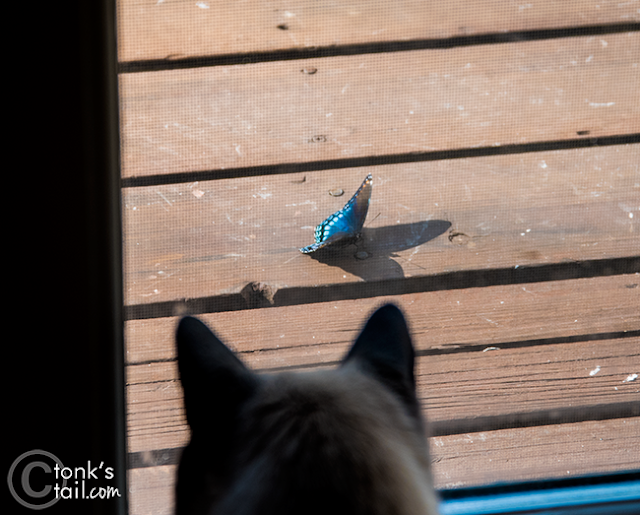 Only one out of three cats checking out that butterfly? What's wrong with you guys? 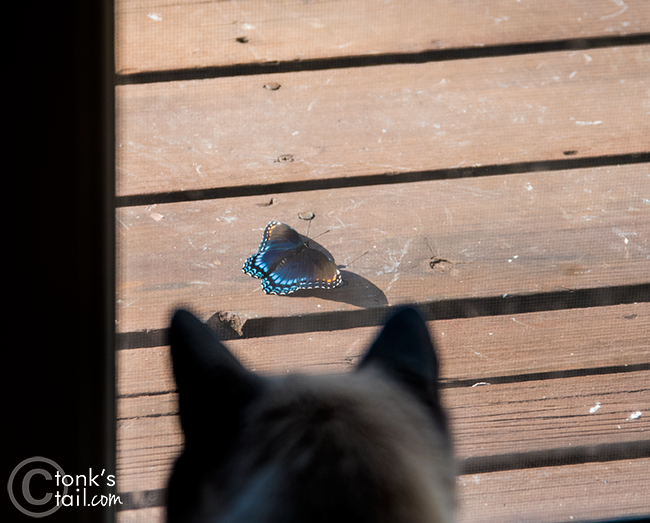 WOW that is truly a beautiful butterfly...nice of him to stop by for a visit!! That sure is a pretty one! #1 says she is very jealous. That is such a beautiful butterfly and she has never seen one like it! You get to have him all to yourself, Maxie! Allie! You sound just like Zulu! We appreciate your visitor, too, Maxie. Just saying. Oh, that's a pretty butterfly. We get a butterfly or two in summer, and we with there'd be more. That's OK Maxwell. WE love butterflies too. Sadly, the last of them have gone South for now. That is a pretty butterfly. I bet you wish he had come indoors to visit you. That is one beauteous butterfly!